Hairstyle to the dress in the Empire style should be festive. It may consist of curls, waves and different types of weaving. Focus on the romance and lightness. If your hair lacks volume, necesite them before creating hairstyles. Hair, dress in the Empire style, hair clips, hair pins with rhinestone, Bobby pins, headband, flower for hair, nail. Dress in the Empire style is suitable for wedding or for prom. These events are remembered for a lifetime. Therefore, the hairstyle should be appropriate. If you have long hair, take the weave. Note that smooth Russian braids are no longer in Vogue. In their place came lush French braid. This technique of weaving seems complicated at first glance. A few times practice, you'll quickly learn. Before you start weaving, moisten hair with water or coat them with foam. This is to ensure that hair does not posiliti. Divide the hair into the top three strands. Give them a conditional index: right-hand strand No. 1 strand in the middle is No. 2, the left lock - No. 3. Start to braid her hair: a strand of No. 1 put under lock No. 2. Strand No. 3 brought under strand No. 1. Now select from of hair on the left side a small lock and connect it with a strand of No. 2. Put this strand under the bottom. Again, highlight a hair strand with the right hand. Connect this strand to the Central. Continue weaving until the hair will not end. To make braid festive, decorate it with beautiful hairpins with rhinestones. Insert the pin in the center of each link of the braid. Bottom lock braid satin ribbon. Chic bow is the perfect accompaniment to a dress in the Empire style. If you have enough thick hair, braid two French braids. To do this, first divide the hair parted in the middle. At the base of the neck weave the two braids together. The connection put on a beautiful hairpin. 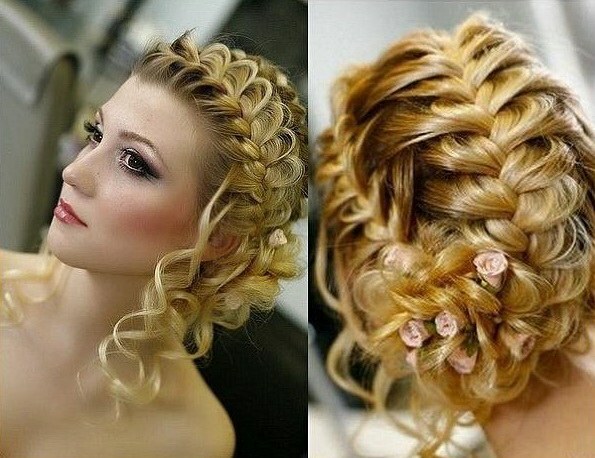 In addition, decorate the hair with flowers. Another beautiful hairstyle for French braids - the Waterfall. Before doing curl the hair and brush: they must lie waves. Acesite all the hair back. Head part of the hair from the face and divide into three parts. Start to weave a normal braid. A couple of links of the upper strand lower down: this is the first trickle of the waterfall. Instead, take a strand of hair lower and continue stitching. When it's turn the upper sections, re-throw it. And take a new from the bottom of the hair. Thus, continue weaving until you reach the opposite temple. This place will secure the "Waterfall" invisible. Can put on this place a beautiful flower or a bow. If you have short hair or medium length style Cool wave. Roll the hair on curlers of about the temple. The peculiarity of this hairstyle is that the hair roots remain smooth. Then comb the curls and nicely place them. Fix the hairstyle with hairspray to wind blow. To make the look more romantic, elegant put on top of the bandage or headband. Another name for French braids - a braid inside out. If you do the hairstyle with a braid in front always leave a few loose strands. They should be nicely curled.